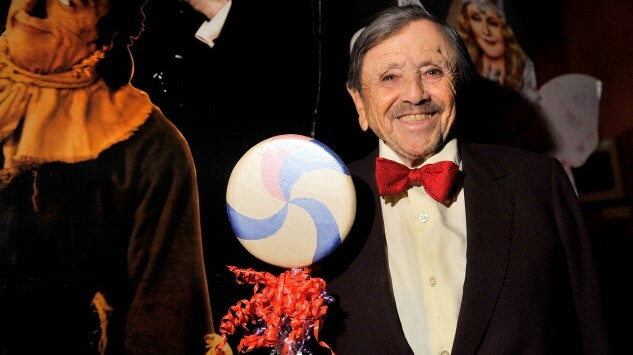 It had been four years since actor Jerry Maren became the last known surviving member of The Wizard of Oz’s original cast of Munchkins. Following the death of actress Ruth Duccini in January of 2014, Maren continued to bear the torch, but its light has finally gone out. Today, news outlets reported the passing of Maren at the ripe old age of 98, in a San Diego nursing home. His passing means that not a single one of the Munchkins remain. Maren was by no means simply a background player in the classic 1939 fantasy film. Rather, he played one of the most recognizable of all the Munchkins, the central member of the Lollipop Guild, which welcomes Dorothy to Oz with a little song. You can see him in the below video, in the center, wearing bright green. At the time the above scene was filmed, Maren was only 18 years old, making his first-ever performance on camera. He stood just three feet, six inches tall at the time. In an interview with The Independent in 2009, he described the set, saying that it was the first time in his entire life that he’d even met another little person. In the decades following Wizard of Oz, Maren continued to perform in a bevy of recognizable films, from Planet of the Apes through a modern day cameo appearance on Seinfeld. His final role came in 2010, but the performer stayed active, often appearing at festivals dedicated to The Wizard of Oz. In 2013, he was honored with a handprint and signature at the iconic TCL Chinese Theater in Hollywood.